The Great Barrier Reef, and most other large reefs around the world, owe their bulk in large part to a type of red algae that grows on corals and strengthens them. New research led by Anna Weiss, a Ph.D. candidate at The University of Texas at Austin Jackson School of Geosciences, has found that ancient coral reefs were also bolstered by their bond with red algae, a finding that could help scientists better understand how reefs will respond to climate change. "Coral reefs as we know them today are a product of that long term coral-coralline algae relationship," Weiss said. "So if we want to preserve our coral reefs, we need to pay attention to the health of coralline algae as well." Weiss conducted the research with Rowan Martindale, an assistant professor in the Jackson School's Department of Geological Sciences. Their research was published in August in the journal PLOS ONE. Coralline algae are a type of red algae that helps build coral reef ecosystems in a variety of ways. They encourage reef growth by attracting coral larvae; they serve as a food source for reef animals; and help patch up broken coral skeletons by growing over breaks. The most important role of the algae when it comes to reef long term growth is directly reinforcing the limestone skeletons of corals with calcite, the hard mineral that forms the algae's skeleton. This allows coral reefs to maintain long-term structures that serve as the foundation of reef ecosystems. Paleontologists think that the algae found in fossilized reefs plays a similar role in reef ecosystems as it does today. Weiss said that her study is the first to test that assumption by quantifying and statistically measuring that the algae has a significant, long term effect on reef diversity and structure. Weiss research involved analyzing data from 128 fossilized coral reefs with coralline algae present cited in the research literature. She zeroed in specifically on reefs that were fossilized in the late Cretaceous and Cenozoic, a period that spans from 100 million years ago to the present. She found that reefs with significant algae fortification were strongly associated with having higher structural integrity and more active ecosystems than those with little or no signs of algae -- a correlation that is also found in modern day coral reefs. "Studying ancient events and ecosystems provide is important information about the modern world," Weiss said. "This work shows that the important interaction between corals and coralline algae isn't new, it goes back millions of years." Today, climate change is warming ocean water and making it more acidic, putting stress on coral reefs around the world. Weiss said that other research indicates that the algae may be more vulnerable to the effects of climate change than coral, a finding that she said exemplifies the importance of learning more about algae's relationship with corals now and in the past. "We know how important coralline algae are to reef building, so that could mean that coralline algae actually play a larger part than corals in determining whether a coral reef survives an ocean acidification event," Weiss said. "My research underscores the importance of coralline algae to coral reefs and confirms the antiquity of that importance." Richard Aronson, an expert on the paleontology and ecology of marine communities and the department head of biological sciences at the Florida Institute of Technology, emphasized the importance of looking to ancient reefs -- and the factors that influenced their life cycles -- to understand reefs in the future. "Those associations [between coral and algae] mirror what we see in contemporary reefs," said Aronson, who was not part of the study. "Whatever the causal relations may be, the important point is that we might be able to track the rise, fall, and recovery of fossil reefs and the environmental correlates of those changes as a way of projecting what might -- or might not -- happen to reefs over the next century of rapid climate change." Materials provided by University of Texas at Austin. Anna Weiss, Rowan C. Martindale. Crustose coralline algae increased framework and diversity on ancient coral reefs. <www.sciencedaily.com/releases/2017/08/170828140713.htm>. Yes coralline might be the most important part of the nice periphyton that covers your rocks. 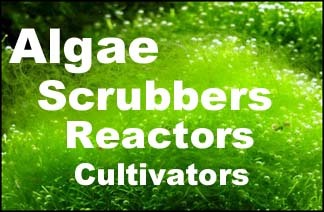 It's also the specialty area of interest of Walter Adey, the inventor of the algae scrubber.